This is the first set of an astrological analysis of all the world's generations. The charts are set for Washington, DC, as it is the capital of the United States, and the charts, in my analysis, describe these generations very accurately. I'm doing the Pluto in Libra, Pluto in Scorpio, and Pluto in Sagittarius generations first, as these three are the first "Aquarian Age" generations as these are the first three generations in the second half of the zodiac, which is about the collective rather than the individual. Most notable placement is the Moon's ruler, Mars, on the descendant, in the 7th house, and conjunct the North Node. This explains the generation's strong focus on relationships and pleasing others, as Libra rules the 7th house, so they have an emotional need to find the "right one". This, along with the Moon in the 9th house, perfectly describes their deep desire for social justice, as well as striving for a more inclusive society, as both Libra and Sagittarius, which rules the 9th house, are associated with justice. This is shown in the Neptune in Sagittarius that around 95% of this generation shares. 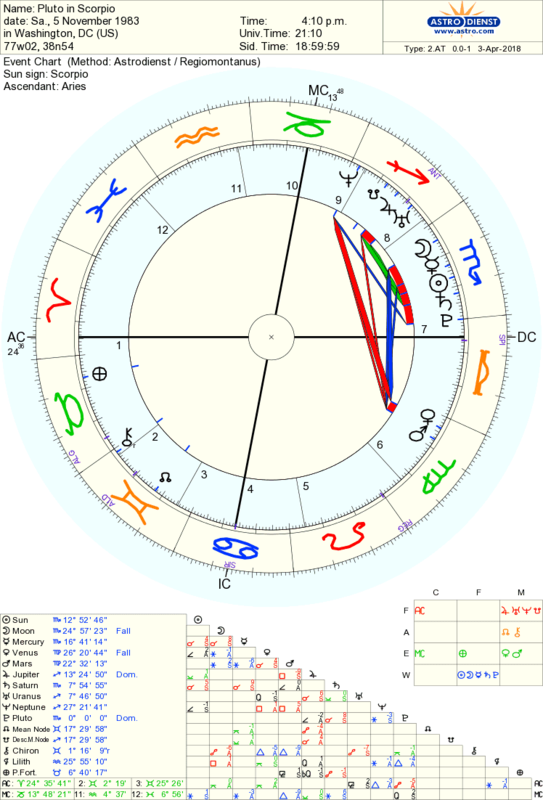 Describing quite the social generation, the Sun (which is also the chart ruler), Mercury, Venus, and Uranus are in the 3rd house, with Pluto also on the 3rd house cusp! I have met very few introverts in this generation, especially compared to the generations it's sandwiched between, and Uranus in the 3rd house, along with Pluto on its cusp, is why this generation was the first to embrace text messaging, as well as social media, as this generation was the young adults when cell phones became mainstream and Myspace started up. They were instrumental in changing, and transforming, the communication methods of the world! All of these planets are in Libra as well, meaning that the Libra influence of people in this generation is far more than just Pluto, because the Sun of the generation itself being in Libra means that everyone in the generation is a Libra to some extent. 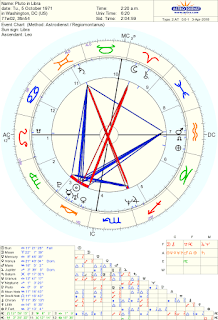 The main thing that stands out to me is the Sun, Moon, Mercury, Saturn, and Pluto all in the 7th house, in Scorpio! This is why this generation has many similarities to Pluto in Libra, as this strong stellum in the 7th house also gives them a strong desire for social justice, and they also share 9th house influence with the Pluto Libras, as Neptune is on the 9th house cusp in the 9th house, which is why they share the desire for a fairer and more inclusive society that's different than the status quo. This generation also has its Sun in Scorpio, along with its Moon, so along with Pluto being in its own sign, everybody in this generation is a Scorpio Sun/Moon to some extent, which makes for a very intense generation (which the Aries rising also indicates). 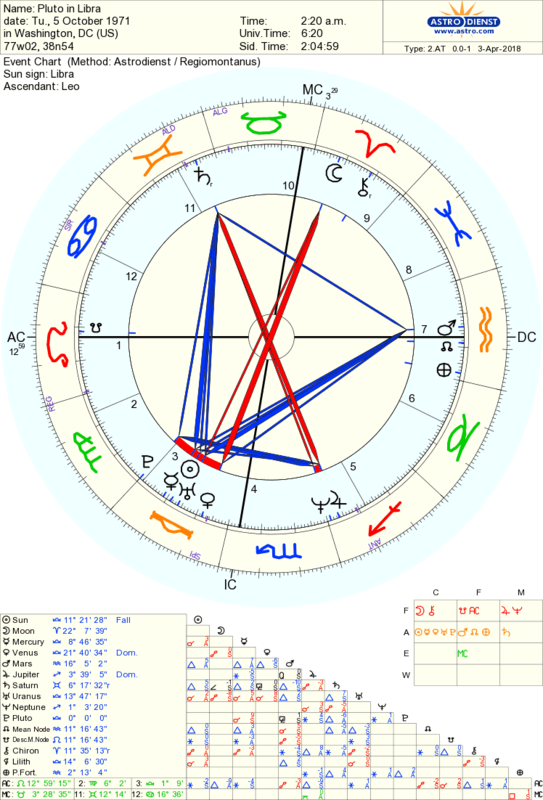 The chart ruler, Mars is conjunct Venus, which is the coruler of the ascendant, in the 6th house, in Virgo, which rules the 6th house, making for a very ambitious generation and why older generations see them as materialistic, which the Neptune in Capricorn that around 90% of this generation shares also indicates. Also notable are Jupiter and Uranus in the 8th house, which explains this generation's interest in the occult, as well as fascination with tattoos, piercing, and stretched earlobes as a way of expressing themselves. While the Sun of this generation isn't in its Pluto sign, unlike the previous two, what is very notable is that the generation has Sagittarius rising, with Jupiter and Venus on the ascendant. This describes how this generation comes off as a whole: Optimistic, positive, and tolerant, yet very accident-prone as a result of recklessness. While the generation's Sun is in Capricorn in the 2nd house (which Taurus rules), which should give them a very materialistic side, it is conjunct Uranus and Neptune, countering the earthiness that Sun in 2nd house Capricorn should give and giving everyone in this generation Aquarian and Piscean energies. Mercury is also in the 2nd house, but in Aquarius. All this Aquarian energy is fitting for a generation that didn't know a world before technology expanded, and is also indicated by the Neptune in Aquarius that around 70% of this generation has, as every Sagittarius Pluto born from 1995-1997 has Neptune in Capricorn, along with most of January 1998 and late August-late November of 1998. The generation's Moon is in Leo, which gives them an emotional need to have fun, that is also intense, as their Moon is in the 8th house. 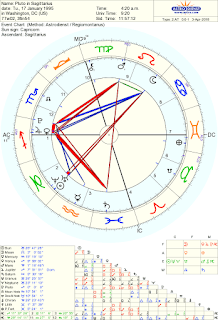 The 8th house Moon is an indicator of this generation continuing the trend of getting tattoos and piercings that the Pluto in Scorpio and Uranus in Scorpio generations set (from my experience, this is happening), and this 8th house energy is prevalent in the intensity and focus of the Stoneman Douglas High School activists in their movement to get semi automatic rifles off the street. Another notable thing is that the ruler of the 5th house, Mars, is in the 9th house, which is an indicator for their love to travel and expand their world views, for fun! 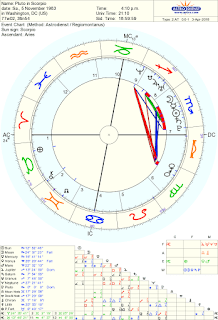 Their Pluto is also in the 12th house, which Pisces rules, giving them more Piscean energy than just Sun and Uranus conjunct Neptune and Saturn in Pisces. 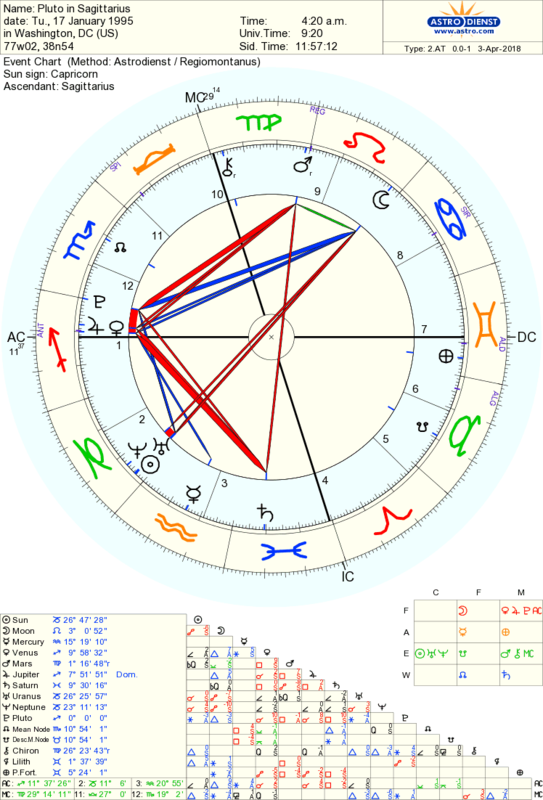 The ingress charts for the generations do show their characters and their roles as a whole, similar to how people's birth charts show their individual characters and roles. More proof that astrology is legit, and not to be taken lightly.